ThunderCats are on the move! ThunderCats are loose, once again! ThunderCats (2011) is a reboot of the 1985 animated series of the same name. The series follows a group of alien cat-people from the Kingdom of Thundera on the planet Third Earth. Led by the young King Lion-O, they travel in search of artifacts that can defeat a re-awakened enemy from the ancient past, the evil sorcerer Mumm-Ra. It's produced by Warner Bros. Animation and animated by Japan's Studio 4°C. It received an hour-long premiere on Cartoon Network on July 29, 2011. Click here to watch the official trailer The series aired on Toonami, like its father before it, up until Cartoon Network lost the rights to it and they reverted back to Warner Bros. on July 20, 2013. Unfortunately, the show was canceled after airing 26 episodes, only half of what was initially planned. Fans of the show had worked hard to convince Warner Brothers and Cartoon Network to give the series a second chance, including an online petition and sending feedback through email and social network sites like Facebook, twitter and tumblr, and suggesting it for crowdfunding on http://www.smgo.tv/ . 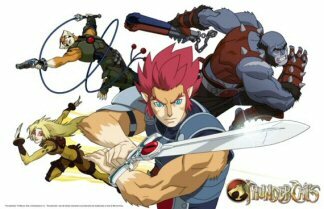 Another reboot, titled ThunderCats Roar, was annouced in 2018. Has a wiki here . Has a discussion thread here . A recap page is currently under construction. NOTE: Tropes related to the characters should be placed in one of the character sheets.